Romanticism fashion. Gauze dresses 1830. Béret en ruban de gaze du Magasin de Mme. Millet, Boulevart Italien, No. 20. Robe de gaze ornée de rouleaux de satin et dꞌune broderie en application de blonde. Journal des dames et des modes. Costumes parisien 1830. France Empire, Romantic Era. Biedermeier era. Early Victorian. This entry was posted in 1830, 19th Century, Costume Parisien, France, Journal des dames et des modes, Restoration, Romantic Era and tagged France restoration costumes, Journal des dames et des modes, Romanticism fashion on 3/11/15 by world4. Bonnet de blonde. 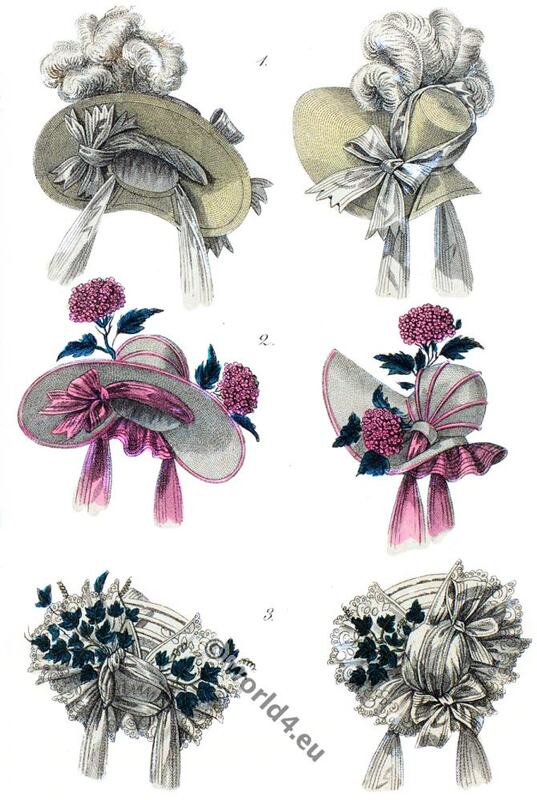 Headdresses parisien 1830. 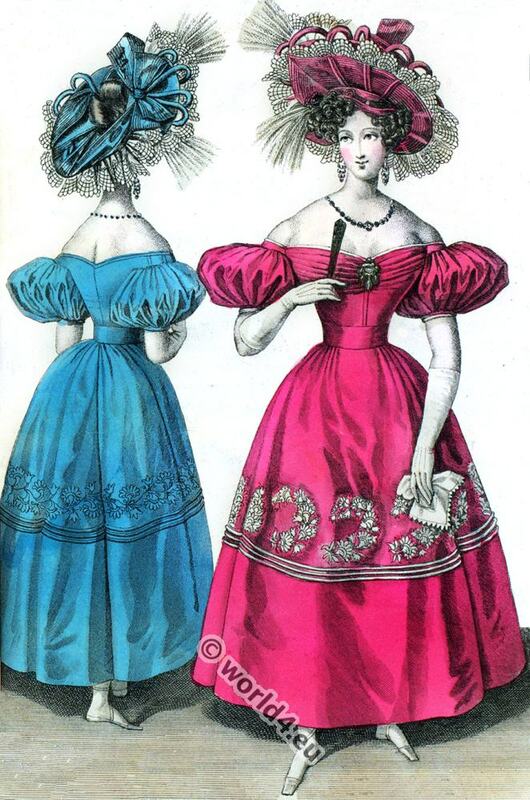 This entry was posted in 1830, 19th Century, Costume Parisien, France, Journal des dames et des modes, Restoration, Romantic Era and tagged Bonnet, France restoration costumes, Journal des dames et des modes, Romanticism fashion on 3/11/15 by world4. Satin jacket. Coat with collar. Cashmere pants 1830. Satin jacket with diamond buttons. Coat with collar and gold buttons. 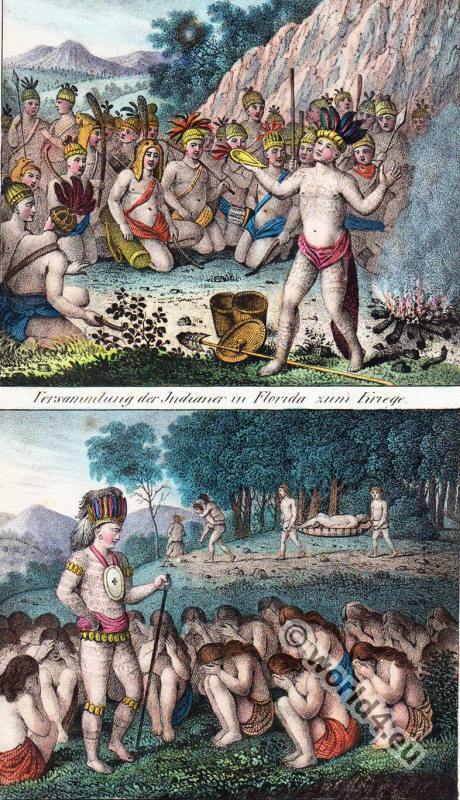 Cashmere pants 1830. Habit à collet de volours et boutons dꞌor. Gilet de satin garni de boutons en diamans. 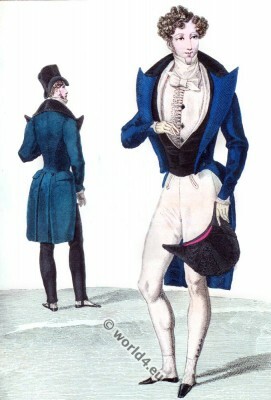 Pantalon de casimir. Claque à gance passementée. Costume dessiné par Mr. Barde, Rue Vivienne, No.8. Journal des dames et des modes. 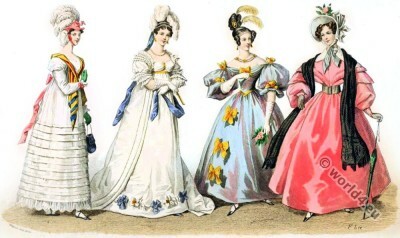 Costumes parisien 1830. Restoration period. Romanticism, Biedermeier era. 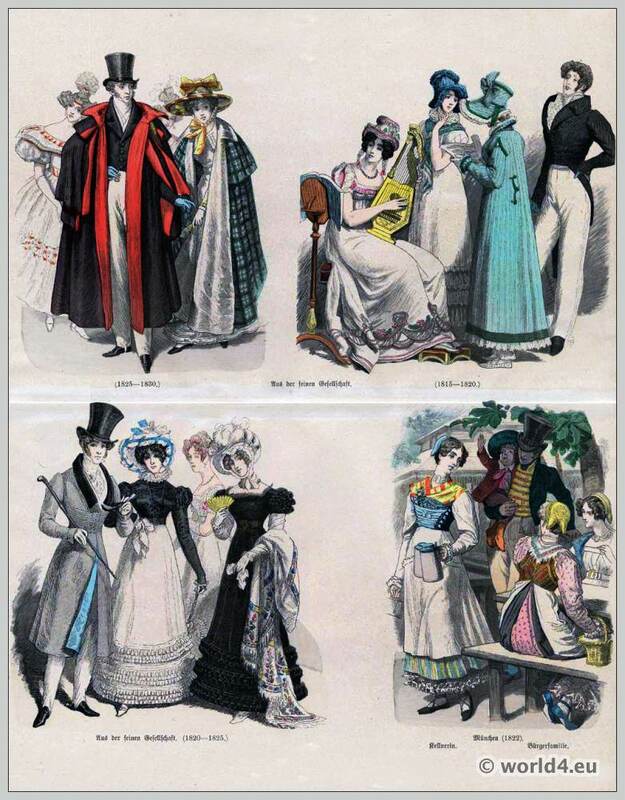 This entry was posted in 1830, 19th Century, Costume Parisien, France, Journal des dames et des modes, Restoration, Romantic Era and tagged Dandy, France restoration costumes, Journal des dames et des modes, Romanticism fashion on 3/11/15 by world4. Romantic fashion in the Reign of Philippe. 1830 to 1848. The Revolution of July, 1830 — Fashions in Louis Philippe’s reign — Microscopical bonnets, called “bibis,” “cabriolets” — Variety of caps — Fashions of the Middle Ages and of the Renaissance — The stage — Historic costumes — Influence of Rachel, the actress — Greek and Roman fashions — Colours — Various designations of materials — Bedouin sleeves — Bonnets and head-dresses — Pamela bonnets — Novel eccentricities — Taglioni gowns, gathered “4 la Vierge,” laced “à la Niobe,” &c. — The “Sylvestrine” — Costumes to be worn on occasions of attempts on the king’s life — Bouquets for balls. 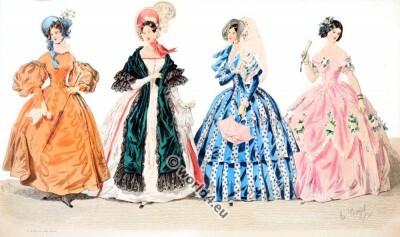 This entry was posted in 1830, 1848, 19th Century, Fashion History, France, Restoration, Romantic Era, Second Republic and tagged Augustin Challamel, France restoration costumes, La Mode, Romanticism fashion on 3/10/15 by world4. 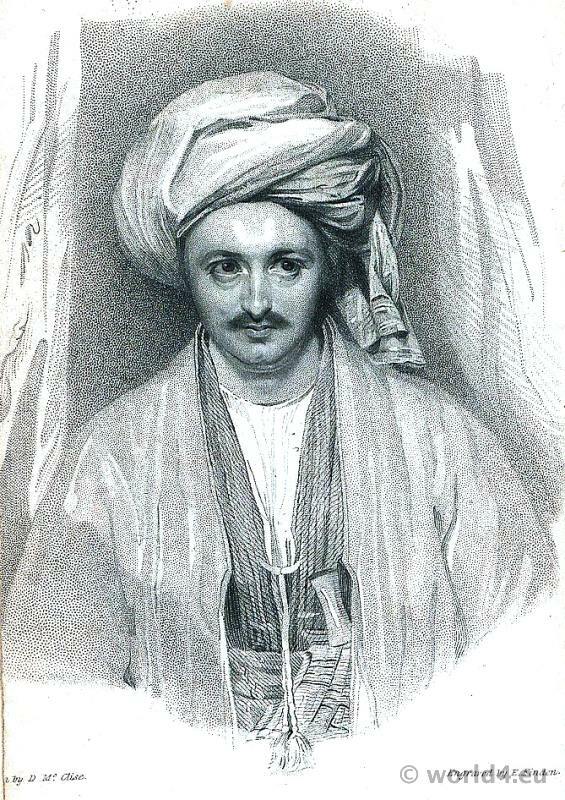 Costume of a Man from Buxoro (Buchara), Uzbekistan 19th c..
From the book by Burnes, Alexander. Travels into Bokhara: containing the narrative of a voyage on the Indus from the sea to Lahore, … and an account of a journey from India to Cabool, Tartary and Persia; performed by order of the supreme government of India, in the years 1831. London, 1835. This entry was posted in 1830, 19th Century, Asia, Uzbekistan and tagged Traditional Uzbekistan costume on 12/9/14 by world4. French Gunner uniform of the Royal Guard. Marechal quartermaster. Gunner Royal Guard. Marechal quartermaster. 1816 to 1830. This entry was posted in 1816, 1830, 19th Century, France, Military and tagged French military uniforms on 10/16/14 by world4. 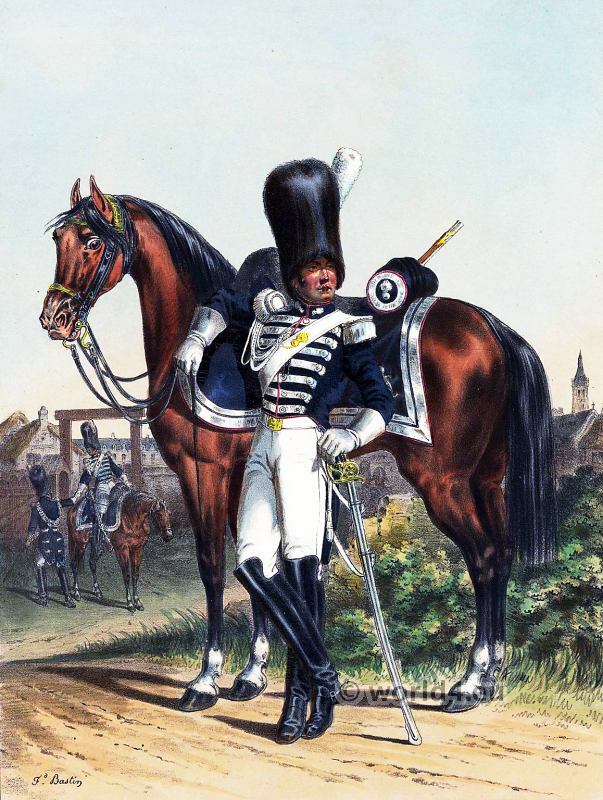 Uniform of French Horse Grenadier of the Imperial Guard. 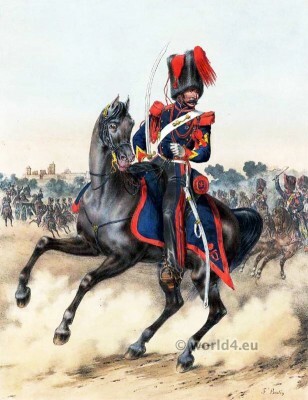 Horse Grenadier of the Imperial Guard 1816 to 1830. French army of 1816 to 1830. Armee Francaise de 1816 a 1830. Grenadier à Cheval. This entry was posted in 1830, 19th Century, France, Military and tagged French military uniforms on 10/16/14 by world4. Lancer of the Royal Guard. 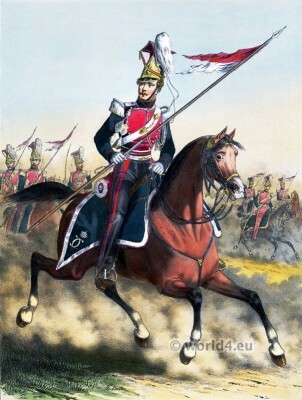 French Lancer of the Royal Guard 1816 to 1830. French army of 1816 to 1830. Lancer of the Royal Guard. Armee Francaise de 1816 à 1830. Lancier Garde Royale.